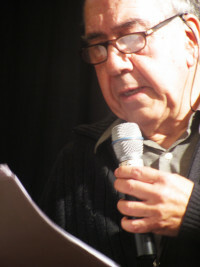 Joan Margarit (Sanaüja, 1938) is the most widely read living poet in Catalan. He is a retired professor and architect. Some of the titles of his books of poetry are: Estació de França (1999), Joana (2002), Casa de misericordia (House of Mercy, 2007) and No era lluny ni difícil (It Wasn’t Faraway or Hard, 2010). He has also published the book of reflections Nuevas cartas a un joven poeta (New Letters to a Young Poet, 2009). He has translated the entirety of his poetry himself and published it in Spanish. He has also been heavily translated into English and Hebrew, with additional books in German, Portuguese, and Basque. He won the National Poetry Prize from the Ministry of Culture as well as the Catalan National Literature Prize, the Cavall Verd Prize, the Cadaqués Prize, the Catalan Critics’ Prize, and the Rosalía de Castro Prize, among others. Tugs in the fog, versión inglesa de su poesía hasta el 2006, translated by Anna Crowe, was recognized by the English Poetry Book Society as a Recommended Translation in 2006. He has translated R. M. Rilke, Thomas Hardy, Elisabeth Bishop and R. S. Thomas.